Muhammad Ali converted to Islam in 1964. 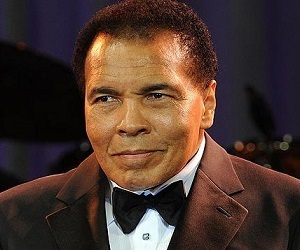 Parkinson’s disease has taken a lot from former world heavyweight champion Muhammad Ali, but it has not taken the boxing legend’s faith in Allah [swt] nor his commitment to social justice. The 73-year-old Ali, perhaps the world’s most famous living Muslim, issued a statement for the Muslim-majority Iranian government to release Washington Post reporter Jason Rezaian, a Muslim-American who has been in prison in Tehran since July 2014 on unknown charges. Rezaian’s wife was arrested at the same time, but she was released three months later.